What are the Trim Levels of the new 2019 Mazda CX-9? Home » Mazda CX-9 » What are the Trim Levels of the new 2019 Mazda CX-9? The 2019 Mazda CX-9 offers drivers a host of new and exciting changes for the new model year! Keep scrolling to take a closer look at each trim level of the new 2019 Mazda CX-9 at Mazda of Lodi in Bergen County, NJ! Click here to learn more about the new Mazda CX-9! The 2019 Mazda CX-9 is available in four trim levels: Sport, Touring, Grand Touring and Signature. Each trim level is fitted with a 250-hp, SKYACTIV®-G 2.5-liter engine and a SKYACTIV-DRIVE automatic transmission. The new Mazda CX-9 – when properly equipped – offers driver an EPA-estimated 20 city and 26 highway miles per gallon. Base Sport models include a MAZDA CONNECT™ Infotainment System with a seven-inch touchscreen, Blind Spot Monitoring System, Rear Cross Traffic Alert, Smart City Brake Support, a rearview camera, Bluetooth® connectivity, LED lighting and more. In addition to the features of Sport models, Touring models include a larger touchscreen (8 inches), Advanced Smart City Brake Support with pedestrian detection, Apple CarPlayTM and Android AutoTM integration, Lane Departure Warning and more. In addition to the features of the Sport and Touring models, Grand Touring models include a 12-speaker Bose® Centerpoint® Surround Sound System with AudioPilot® technology, an Active Driving Display with Traffic Sign Recognition, the Mazda Navigation System, a 360-degree View Monitor and more. In addition to the features of the Sport, Touring and Grand Touring models, top-of-the-line Signature models include LED grilled lighting and signature badges, Auburn Nappa leather seating and trim, Santos Rosewood inlays and more. 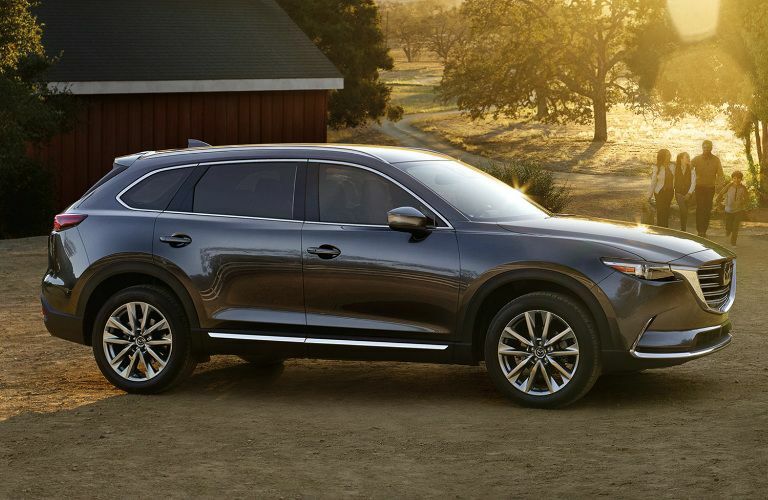 If you’re interested in learning more about the new 2019 Mazda CX-9, contact us or stop into Mazda of Lodi and talk to a member of our friendly and knowledgeable team! Test drive a new 2019 Mazda CX-9 today and experience everything firsthand! We’re here to help with all of your Mazda and service needs! What are the Color Options for the 2019 Mazda CX-9? This entry was posted on Friday, September 7th, 2018 at 7:13 pm	and is filed under Mazda CX-9. You can follow any responses to this entry through the RSS 2.0 feed. You can skip to the end and leave a response. Pinging is currently not allowed.